A surefire way to get people talking about your previously unheard-of brand? Beating a large Apple logo-shaped ice-sculpture with hammers. Job done. 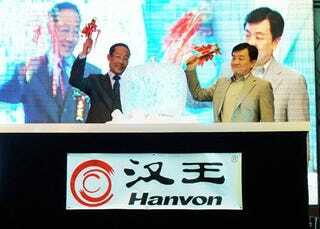 Hanvon, a Chinese company with a self-explanatory TouchPad B10 product to sell, took to the Apple sculpture with hammers at a recent event, to—in the words of Chinese news site R2PC.com—"express to Apple declaration of war."